In 2015, nearly 18% of the US population was of Hispanic origin, constituting the largest ethnic minority in the country. This segment is expected to grow, from 56 million in 2015 to more than 77 million in 2030. Despite this demographic trend and the enormous market opportunity it represents, efforts to understand the Hispanic consumer are absent or sporadic at best in many companies, which tend to consider it a niche market. Marketing to Hispanics is full of complexities. They are part of the general market and sometimes show similar attitudes and behaviors to those observed among non-Hispanics. However, they often think and behave differently, influenced by factors such as generation order, language preference in different situations, country of origin, length of time living in the US, family traditions, and cultural values and traditions from their home countries. ASSESS the market opportunity for your products and services in this segment. DEVELOP a marketing strategy that organically integrates this segment in the context of the general market, allowing you to allocate resources effectively. OFFER deep cultural insights that allow you to uncover “untapped” needs to pursue. PROVIDE guidance on how to position products/services to reach Hispanics and what messages resonate with them. IDENTIFY the most effective media vehicles and distribution channels that should be used to reach this segment. 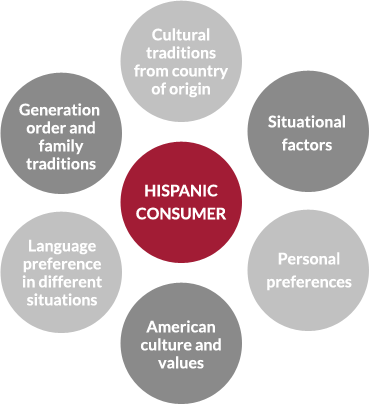 UNDERSTAND differences and similarities between Hispanics and non-Hispanics that can be used in marketing strategies and tactics. DETERMINE the most profitable sub-segments, giving you a profile of who your best customers are within the Hispanic market. CREATE culturally sensitive and appropriate advertising, which will prevent you from committing cultural blunders in your communication and marketing materials. Hispanics, which are comprised of different races and countries, are a very diverse market segment. They are often classified by acculturation levels, but how much of a “Latino” or “American” behavior they engage in is often dictated by the situations they face. Marketers would benefit of understanding Hispanics in the context of the general market and use similarities and differences with non-Hispanics to better target this segment as part of an overall marketing strategy.